If you need auto parts SEO services we can help. After all, you probably landed on this page using SEO! Looking for auto parts SEO services from an SEO company? If you need auto parts SEO services, we’re an SEO company that is different from other companies you may be looking at. We’re experts in automotive SEO and have been for over a decade. SEO services done in-house by “car people.” We’re from the automotive industry! Regular reporting on SEO services and scheduled client meetings. SEO services with a focus on sales and ROI. SEO strategies based on year/make/model, part type or function, enthusiast words and part numbers. Experience with the website platforms commonly used to sell auto parts (scroll down). We only work in the automotive industry. We base our SEO services on our own SEO case studies, research and testing, not guesswork. You get a strategic aftermarket marketing partner with Hedges & Company. We advise you on current 2019 automotive SEO trends and best practices. We include specialized strategies such as improving your clickthrough rates, adding extensible schemas and structured data, social media marketing for natural inbound link building, monitoring your competitors, and more. Our auto parts SEO services are effective because we discover new opportunities for your website. Finally, we understand the auto parts Road to Purchase for consumers shopping for automotive parts & accessories. The parts buying process is non-linear. 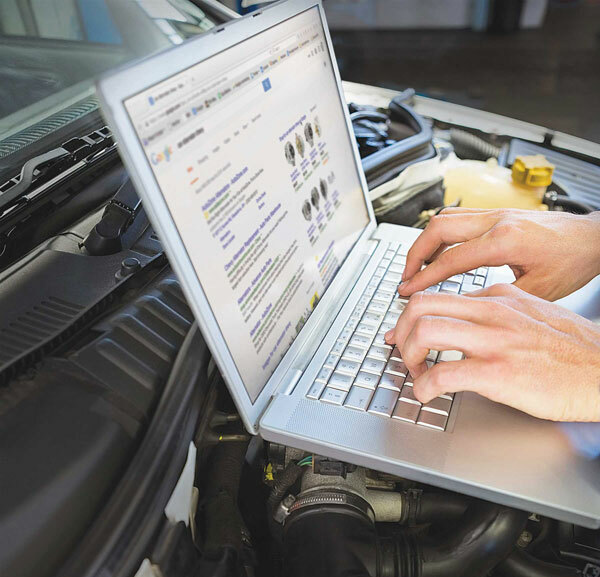 Consumers search for auto parts in different ways along the Road to Purchase, as they do their online research. Consumers use part type searches, year, make, model or submodel searches, part function searches, part symptom searches, and part number/brand searches. We’re experts at optimizing automotive parts sites built on platforms such as Web Shop Manager or eTools Developers, OEM auto parts sites built on RevolutionParts, and automotive sites built on Magento, Shopify, BigCommerce, WordPress and WooCommerce. Your SEO account starts with a kick-off call and strategic planning discussion with your new auto parts SEO services team. Your business and your goals are unique and it’s our job to understand them. It’s also our job to turn that into an SEO action plan. In 2019, auto parts SEO is about topics, solutions and user engagement, and creating unique, useful content for your customers to find. We give your website an extensive analysis of automotive keywords because we want to know how your site is found organically. We analyze which automotive keywords bring the most qualified shoppers and which keywords work for your competitors. We look at the overall competitive landscape to find opportunities for your site to rank. Please scroll down to the table below to learn about our SEO marketing approach and methods. It gives you a quick look at why it’s important to know the aftermarket industry to optimize any site. It also shows why we’re so different from other auto parts SEO marketing companies. Free analysis of your auto parts online marketing! More than 4 out of 5 automotive enthusiasts begin their search online using Google, Bing and Yahoo. That’s what makes automotive PPC so important! Consumers are constantly connected: they move effortlessly from computer to tablet to phone and your Internet marketing should, too. Enthusiasts use the Internet to research products and make decisions on where to buy, as well as which brand to buy. Internet marketing benefits manufacturers as much as it does retailers. Manufacturers can control their own branding message using PPC. Sell auto parts? We can create effective organic search campaigns to drive more sales to your website. You can reach buyers while they’re shopping and making buying and brand decisions. It’s important to develop page content in the context of what consumers are searching for, so we pay close attention to long tail keywords, like part type or make, model and year. You’ve probably heard “content is king” but context of a search is a close second (maybe context is the queen?). You’ll want your product pages to show up for searches with a high purchase intent. Reach shoppers making buying decisions by using effective organic search marketing and sell direct or send them to your dealers. More than half of all auto parts & accessories buyers visit manufacturer websites to do research before buying a product. Bring your new products to market quickly and create consumer demand and pull-through sales. Online marketing lets you take control of your brand. Increase ticket sales by being found on more search engines. SEO can be more effective than traditional media buys such as radio or TV advertising. We also specialize in Facebook, Twitter and other types of social marketing to reach your fans’ friends and expand your online organic reach. We utilize JSON-LD code and schema so Google recognizes events, times and ticket sales, and and displays these important things for search activity, often in the Google Knowledge Graph (also known as Position Zero). Manufacturers: even if you don’t sell online you should be visible online. Nine out of 10 aftermarket parts buyers do their part and brand research online before buying, even if they’re going to buy in a retail store. Today’s parts buyers are obsessed with research before buying. It’s critical to be found online. We want to earn your business and become your auto parts SEO company. Auto parts SEO is a different process in our industry than it is for other retailers or manufacturers because of the unique differences in our industry’s products and our industry’s consumers. Here’s a handy comparison of typical search engine optimization activities we think are important to growing your sales if you’re in the auto parts business. Keep this comparison in mind when talking to any digital agency that specializes in organic search. Understanding “long tail” auto parts SEO terms, which are search phrases using 3 or more words) (See our article on long tail search for more information.) Auto parts and accessory consumers typically use long tail (3 or more) search terms, including year, make, or model combinations, vehicle submodel, or part type or function, etc. Examples: “2014 Mustang exhaust system” or “Cummins diesel turbo EGR.” Generalized companies without automotive experience, that try to work in many different industries, may not understand the value of long tail searches, may not understand the differences in long tail phrases. Or they may not understand differences between generations of car/truck models with different engines or chassis codes. Being found organically for part numbers including long complex OEM part numbers: Today’s research-obsessed consumers often know the specific part number they’re looking for. Part number searches are searches with high purchase intent. These searches are often modified by brand terms of the manufacturer. Conventional search agencies aren’t likely to understand how consumers search for manufacturer part numbers or crossover part numbers in organic search. Understanding the latest automotive trends, especially new automotive products, important for automotive SEO companies: Understanding the latest industry trends and new products is important when strategically planning an online campaign. We attend the SEMA Show, AAPEX and the PRI Show every year and have our finger on the pulse of the automotive aftermarket. Non-automotive search companies aren’t aware of trends in the automotive parts aftermarket, and probably don’t qualify to get into the trade shows either. When discussing automotive parts SEO, we sometimes get asked is it better to focus on creating inbound links to improve automotive rankings, or is it better to optimize organically by building unique and usable content? Or maybe it is a combination of both? Good, engaging content that provides useful information to the customer is what tends to rank highest organically. In other words, build pages for the reader, not for Google. And engaging content is a requirement for any effective link building campaign. Relying on inbound links that aren’t built naturally—or worse, paid inbound links—is a good way to have your site penalized by Google, resulting in a drop in your organic rankings. For solid SEO that won’t backfire on you, we put a priority on your website and your site structure (making sure it is correct with tags, for example). We like to verify that image alt tags are present and correctly optimized. We also like to make sure Google Search Console and Bing Webmaster Tools accounts are set up. And, most importantly, we make sure the page educates the consumer with well-thought-out, engaging automotive content. We’re often asked about our market research background. To us, it’s important to base decisions on facts and data, not opinions. Most of what we do is based on our knowledge of enthusiast shopping and browsing behavior. We’ve surveyed over 500,000 race fans, car and truck enthusiasts, and hard parts buyers over the past few years. Plus, we do extensive keyword research for each individual client. All of this helps us create a cost-effective approach to providing superior services to our clients. If you actually got this far down on the page, maybe we should talk about helping you sell auto parts online! Thanks for your interest and sticking with us down this long page, and if you need more information please give us a call. Hedges & Company was started in 2004 but our experience managing online marketing dates back to early days of the 1990s. Our team has been working with online marketing in the automotive aftermarket longer than anyone else we can think of…in fact, our agency founder started one of the first parts websites in 1990s. We’ve worked with many of the top brands in the aftermarket improving their auto parts SEO results. We’d love to be your automobile SEO company.